$68.00 "Soviet Porcelain of 1920s-1930s in Private Collections of St. Petersburg", E. Sametskaya. Russian text. Beautiful quality 349 p hard cover. The focus of the book is early masterpieces by the Leningrad Lomonosov Porcelain Factory (aka LFZ). Outstanding reference. $75.00 "Catalog of Hallmarks on Items in Precious Metals, 1917- 2000 (USSR and Russia)"	N. Troepol'skaya. C. 2006, Moscow. Russian text. Massive volume, 8 1/4" x 10 1/2" x 1 1/2" format, hardcover, 717 pp, contains a guide to over 22000 individual hallmarks. OUTSTANDING and INVALUABLE reference! $60.00 "M. V. Lomonosov Leningrad Porcelain Factory, 1944 - 2004" , Nataliya Petrova, C. 2007, St. Petersburg. Massive Russian-language hardcover, 896 pp, 11 ¾ "x8 ½ "x2" format. This monumental work encompasses 60 years of history of the venerable LFZ, the most famous of all Soviet porcelain makers. The book contains staggering amount of information and photos, by far the best book available on the subject. Single copy in stock. $42.00 "Leningrad Glassware from Private Collection" I. Nasonova & S. Nasonov, 2007, Moscow, Russian text; Russian & English captions. Hard cover, small format (6" x 8 ¼" page size) with integral silk bookmark, 127pp, many full color illustrations. $65.00 "Fedoskino", Nikolai Malakhov, C. 1990, Moscow. Beautifully illustrated catalog encompassing best examples of Fedoskino lacquer boxes from the early XIX C. through the late Soviet era. In Russian and English, hard cover with slip case. A scarce Soviet period publication in near mint condition. $90.00 Fantastic "Soviet Propaganda Porcelain" E. Sametskaya, C. 2004, Moscow. Limited edition cloth bound hard cover in presentation box. Russian text, 477pp, massive work with over 800 magnificent color photos of the finest works of early Soviet Avant-Garde porcelain each of which demonstrate the distincive 1930s style of Socialist Realism and Constructivist Art. Out of print, single copy in stock. $120.00 "Soviet Ceramics, the Sandretti Collection of 20th Century Russian Art". Catalog of the 2004-05 Exhibition in Italy. Russian and English text. The book presents a magnificent array of Soviet propaganda and decorative porcelain and faience, including some rare early pieces by less known makers. This catalog is long out of print and is a rarity in and of itself. An outstanding resource for the collector! Single copy in stock, in near mint condition. $80.00 "Soviet Porcelain. The Artistry of the Lomonosov Porcelain Factory, Leningrad", by Alla Lansere, C. 1974, Leningrad, in Russian and English. Printed in DDR, this deluxe, large format "coffee table" catalog of some of the best LFZ works. Single copy in stock, in excellent like new condition. $150.00 "State Porcelain Factory, 1904 - 1944", T.N. Nosovich, I.P. Popova, C. 2005, St. Petersburg. Massive Russian-language 752-page hardcover, 11 ¾ "x 8 ½ "x 2" format. This monumental work encompasses 40 years of history of the premier Russian porcelain maker that is currently known as LFZ. The book contains staggering amount of information and photos, by far the best book available on the subject. Single copy in stock. $75.00 "Soviet Porcelain [Volume 3]" I. Nasonova & S. Nasonov. 2008, Moscow. Russian text. Cloth bound hard cover w/dust jacket and integral silk bookmark, small format (6" x 8 ¼" pages), 372pp, full color photographs. Third volume in a comprehensive series of books that thematically covers the amazing output of Soviet porcelain factories. $65.00 "Soviet Porcelain [Volume 5]" I. Nasonova & S. Nasonov. 2010, Moscow. Russian text. Cloth bound hard cover w/dust jacket and integral silk bookmark, small format (6" x 8 ¼" pages), 368 pp, full color photographs. Fifth volume in a comprehensive series of books that thematically covers the amazing output of Soviet porcelain factories. This volume includes very detailed biographies of the famous Soviet porcelain artists, complete with the dates of major exhibitions, publications featuring their works etc. Single copy currently in stock with a minor damage to the dust cover, otherwise in mint condition. $130.00 "Marks on Soviet Porcelain, Faience, and Majolica, 1917- 1991" I. Nasonova, S. Nasonov, I. Golskii, and G. Dvorkin, 2009, Moscow. Russian text. Two cloth covered hardback volumes in a slipcase have a total of more than 600pp. Each volume w/dust jacket and an integral silk bookmark. Illustrates full color examples of hundreds and hundreds of individual marks. 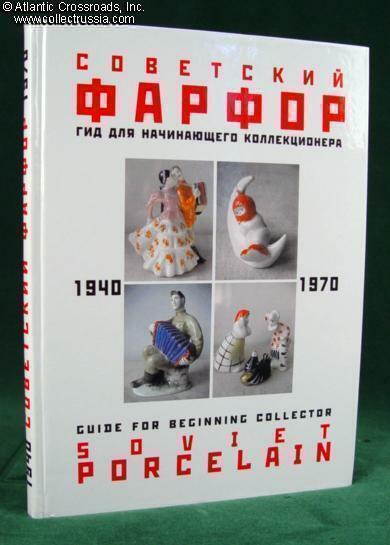 An invaluable reference that not only covers Soviet porcelain but virtually all of the post-Soviet ceramic output, too. $75.00 "Cast Iron Art, 1920 - 2009", Aleksandr Zak, C 2009, Ekaterinburg. Russian text hardcover with beautiful close up photos of over 300 examples of Soviet decorative cast iron statuettes and busts. Both main manufacturing centers, Kasli and Kusa, are amply represented. Special attention is given to the foundry marks and small distinguishing details of the figurines. $29.00 "USSR Folded Letters [and Envelopes] of 1941-1945, Price Guide" by V. Zagorskiy. In Russian, 92 pp. This catalog has over 500 color photos of WW2 era Soviet envelopes and famous "triangle" letters, all with patriotic artwork and slogans. The prices are in rubles.